Roger Ebert: "Once Upon a Time in the West" is good fun, especially if you like Leone's way of savoring the last morsel of every scene. A final shoot-out between Henry Fonda and Charles Bronson, for example, takes at least 15 minutes. They walk. They wait. They circle each other. They stare at each other. They squint. They spit. They take off their jackets. They wince. Just when they finally seem prepared to shoot after all, Leone uses a flashback. But why hurry a good shoot-out? The New Republic: The story could have been told, as it often has been, in 80 minutes or so. But, in his editing, Leone anatomizes every scene into its components, expanding small incidents into small dramas: for example, a sequence in which water drips on Woody Strode’s head, then his hat, is made into a little pantomine of stolid humor. It’s Leone’s intensity with these details of editing, his concentration on small stuff, that gives the picture what interest it has. When it gets into the plot lines and personal relations, when it gets figuratively off the movieola and on to its feet, the picture reveals how thin it is. But for the first hour or so, the loving care that Leone gives it is so tender—even in the many killings—that it is almost breathtaking. AV Club: As biographer Christopher Frayling notes in the audio commentary, the violence in Leone's work happens at the speed of a lightning draw–unlike, say, the slo-mo bloodletting in Sam Peckinpah films–but the buildup moves at a tense crawl. Without seeming overly deliberate, Leone lingers over the sensual elements in a scene, from the contours of Cardinale's face to the symphony of natural sounds (a creaky windmill, a buzzing fly, water dripping on a cowboy hat) in the famous opening-credits sequence. Working from his memories of American Westerns (according to photographer Tonino Delli Colli, he divined precisely where John Ford placed his camera in Monument Valley), Leone infuses borrowed ideas and images with an overwhelmingly cinematic, dreamlike intensity. Movie Mezzanine: The film’s most distinguishing aspect is its music, which soars hauntingly in the film’s most memorable scenes. The great composer Ennio Morricone, Leone’s longtime collaborator, infuses the film with its solemn identity. Whereas the music for the Dollars trilogy was marked by its impish energy, Once Upon a Time in the West is by turns elegiac, grim and wistful. It is its grave tempo that allows its scenes to play out more patiently than its predecessors. His incredible use of music is but one facet of his aural prowess, as he displays an uncanny sense of imagery with sound, as evidenced in the film’s first two sequences, involving a massacre at a train station and another at a secluded family outpost. NYTimes: Although "Once Upon the Time in the West" has moments of genuine impact, such as an early shoot-out between Bronson and three hired killers at a lonely way station, it is mostly fun for the way it cherishes movie styles and attitudes from the past. It's no accident that people like Lionel Stander, Jack Elam and Keenan Wynn turn up in supporting roles, or that when Miss Cardinale, newly arrived in the West, takes the carriage to her husband's farm, the route takes her through John Ford's Monument Valley. I also like the kind of pure movie exchange that takes place when Henry Fonda confronts one of his men for having betrayed a confidence. "How can I trust a man who wears both a belt and suspenders? He don't even trust his own pants." The Atlantic: This film unfolds on multiple levels. Most literally, it is the story of a woman thrust into the violent, mythic universe of Leone's West, a world made up of men with guns and their victims. Cardinale arrives by train in the fictional town of Flagstone (Flagstaff? ), Arizona, but the new husband she expected to meet her at the station isn't there. (The crane shot that follows her from the platform into the station and then, lifting over the roof, out into town is a beautiful bit of camera-work.) She makes her way out to his hardscrabble ranch in the middle of nowhere, where she learns that he and his three children have been killed by landgrabbers led by Fonda and hired by Ferzetti. From this point, Leone's three gunfighters (Fonda, Bronson, and Robards) begin circling Cardinale and her land, each with his own motives and methods: Fonda imagines that by taking the land for himself he might stop working for Ferzetti and instead replace him; Robards, framed for the murders by Fonda, wants to know why; Bronson, seeking revenge for an unknown wrong, uses the land to lure Fonda to him. The three approach Cardinale alternately as predators and protectors (often it's difficult to tell which) until one by one, they take one another out of the picture. Cardinale is marvelous in the central role, her face a canvas on which Leone paints (in close up, of course, and with little dialogue) a subtler range of emotions than his male protagonists ever had to display: loss, disappointment, regret. Her scenes, many of which take place indoors at the ranch, serve to humanize Leone's work, to suggest that there might be an alternative to the wilderness and carnage outside the door. Which bring us to the second dimension of the film: It is a meditation on the civilizing--and the consequent destruction--of the masculine West of Leone's previous films. 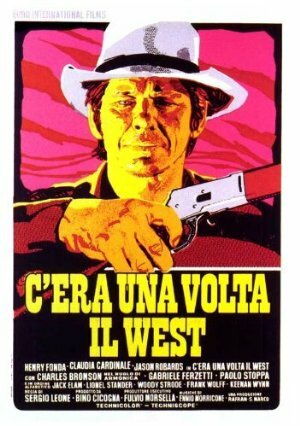 The Italian title of the film is C'era Una Volta Il West, which translated literally means "Once upon a time there was the West." Leone is not telling a story set in the West, he is telling a story about the West, an explanatory fable about why it came to an end. That end is metaphorically brought about by Leone's two new characters, Ferzetti and Cardinale. Ferzetti, with his money and his train, personifies the twin engines of capitalism and technology. The former corrupts and weakens, the latter obviates the need for heroes. (It is no coincidence that the movie both begins and ends with the arrival of a train.) This theme is made explicit when Fonda recognizes that Ferzetti's methods--cash and surrogates--will never work for him, and decides to confront Bronson directly. "So you found out you're not a businessman after all," Bronson tells him. Fonda replies, "Just a man." "An ancient race," Bronson muses. "Other Mortons will be along and they'll kill it off." Cardinale's role in the passing of the West is never made quite so explicit but is equally central: She is the pioneer woman who brings stability and order, who domesticates the masculine chaos around her. As the railway workers arrive at the end of the film, bringing commerce and modernization, she is the only remaining character who does not flee back into the wilderness. On its final level, Once Upon a Time in the West is about not only the end of the West but the end of the Western. Written by Leone, Bernardo Bertolucci, and Dario Argento, master cineastes all, it is a film about film, a loving encapsulation of--and eulogy for--the American Western. Christopher Frayling, author of the Leone biography Something To Do With Death, cites innumerable allusions to classic Westerns, including High Noon, Shane, The Searchers, The Iron Horse, The Man Who Shot Liberty Valance, Johnny Guitar, and The Magnificent Seven. But Leone, Bertolucci, and Argento don't merely appropriate the elements of classic Westerns, they subvert them. Frayling notes "the series of often ironic reversals of famous moments from the Hollywood Western." As in High Noon, three gunmen working for a villain named Frank wait at the train station; but in this case they are waiting not for Frank but for his nemesis. As in Shane, a young boy goes hunting with his father, pantomiming shots at the birds overheard; but instead of encountering their champion they find only death. As in The Searchers, the cicadas' sudden silence and the birds taking wing portend an attack on the ranch; but it is not Commanches who lurk in the brush. Leone's subversion of the Western extends to his casting: Two of the three gunmen waiting for Bronson at the train station are recognizable veterans of American Westerns: Woody Strode, who appeared as a hero in several John Ford movies, and Jack Elam, who played a villain in countless films. The director kills both by the end of the first scene. Indeed, it's rumored that Leone tried to reunite Eastwood, Wallach, and Van Cleef to play the roles of the gunmen. By killing them off in the first 15 minutes, Leone would have made explicit not only his break with the "Dollar" films, but his burial of the Western altogether. In a film full of amazing performances, that fly takes the cake. If only they had gotten Clint, instead of Bronson, this movie would've been a huge moneymaker. As it is, a classic. That freaking harmonica.... the whole scene shoplifted by Sam Raimi in The Quick And The Dead. It's an amazing movie. I can't think of another movie that uses time -- stretched out and then released like a rubber band -- so effectively. I have watched a lot of films with wind turbines in and this has to be the best use of the old high solidity American plains turbine in any movie. Probably the best Ennio Morricone score, which is damn high praise indeed. A friend of mine recalls a seemingly pointless visit, as a child in Utah, to ".. the brick arch where Bronson's character flashbacks to his youth and the original lynching incident .. built near a small airport fifteen miles north of Monument Valley, in Utah and two miles from Highway 163." Henry Fonda is so good as a villain in this that it actually slightly pisses me off now that he always tended to play good guys. Met three dusters like this recently. They had three men in 'em. The men had three bullets in 'em.